I have often wondered if working at a library was the place I was supposed to be. I arrived in the United States in 1986 and the following year landed my first job at Mather Air Force Base Library in California. It was a bit intimidating working as a Library Aid while not knowing anything about the new country I now called home. I remember the first time a patron asked for the Sacramento Bee — the local newspaper. I had no idea what they were referring to. So I made it a point to memorize every single periodical by name and type. 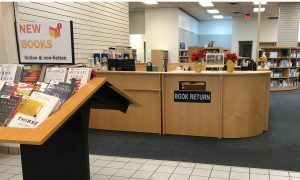 It was a time where the only computer in the library was used by a few staff members, and each book had a card that, upon checkout, was filed under the patron’s name at the circulation desk. Some of my fondest memories included the large wooden card catalog, the microfiche reader, the vertical file, and the typewriters that were used to type every spine label. We left California in 1992 and arrived in the Florida Panhandle. After the birth of my son, I decided to volunteer at an elementary school and the Contracting office on base. Later on, I returned to college and received my degree in Computer Science. At the time, I felt ready to conquer the world and set forth to find that high paying job everyone else was seeking, but as I quickly learned, living in a military community…it was not going to be that easy. The Panhandle Job Fair was being hosted at the Fairgrounds, and I decided to attend with the intent to land that big information technology job and got very discouraged every time I was asked, “do you have a security clearance?” Well, of course not. So on my way out the door, I was told about a Library Technician job at Hurlburt Field Air Force Base. At the time I felt a bit disheartened by the idea of going back to working in a library, but I took a chance simply because it was a full-time federal position with benefits. So, if you ask me… I am exactly where I am supposed to be.